A story was recently in This Week Hilliard about a parcel of land being declared a "qualified data center site." This was of particular interest to me as my last assignment before retirement was to lead the web hosting business for MCI Worldcom, which included the construction and operation of very large data centers around the world. It was a return to my roots, as I spent many years in data center and network operations for CompuServe. I believe the land referred to in this article is a parcel owned by the family of former State Representative Larry Wolpert, which is located just north of Davidson Rd, at the place where Trueman Blvd ends. I expect that the reason this Wolpert parcel could so easily be declared a qualified data center site is that CompuServe put in all the legwork in the 1990s to build our large campus and data center on Britton Rd. We required redundant power sources (from more than one substation) and substantial data communications capability, leading both AEP and AT&T to install lots of capacity to the Davidson/Britton area. Since much of my attention these days is focused on our school district and the community economics related to the schools, one must ask the question - is it a good thing to attract a data center operator to this site? Let's examine the former CompuServe property, now owned and operated by Verizon. The County Auditor's tax page for this parcel shows that it is valued at $37 million, and generates $1.26 million of property taxes, of which $834,249 is paid each year to the schools. That's the equivalent of the taxes paid on 185 homes valued at $200,000 each - a whole subdivision. And no kids to educate. Revenue, but no expense (at least for the schools). All good. That makes it sound like having a new large data center in Hilliard could be a gold mine. Currently the Wolpert parcel is a farm field, and because of a state program called Constant Agricultural Use Valuation (CAUV), this 47 acre parcel is valued at only $63,920, and generates annual school property taxes of just $1,157, or $25 per acre. I have no problem with giving farmers a break on their property taxes, but let's recognize that CAUV distorts the school funding algorithm, which is the reason many agricultural school districts are deemed to be "poor." Our state income tax dollars flow from us to become state school funding to agricultural districts because of the artificially low valuation of farmland. In other words, our combined property and state income taxes pay fully for the cost of running our own Hilliard Schools, and also subsidize the cost of running the schools in the rural districts. CAUV is a farm subsidy program funded by redirecting state taxes from suburban school districts to agricultural districts. A data center won't likely be valued at the kind of money the Verizon campus is. CompuServe built this campus primarily to house professional staff, and so it has lots of expensive office space, which isn't needed for a standalone data center. Most of the money spent on a data center is for the electrical systems, including large backup generators, and the air conditioning. Once they're filled with computers, they consume vast amount of electricity and generate incredible amounts of heat. That's the reason folks like Google and Microsoft have built some of their most massive data centers near hydroelectric dams on the Columbia River in the Pacific Northwest, such as the Google Complex at The Dalles, OR. Very large data centers can be staffed by very few people, meaning not much income tax revenue for the city. The Google complex I mentioned houses hundreds of thousands of computer servers, but according to the Google website needs only 80 people on the local staff (most of whom seemed to be windsurfing on the Columbia River when I was last out there). I think the City of Hilliard might be underwhelmed by the amount of payroll tax generated by such a facility. How about the school district? I don't know anything about Oregon property tax laws, or what kind of deal Google might have struck with the local governments. Google says they invested $600 million in the facility, and I'm sure much of it was for the computers/servers and network equipment. If that facility were built in Ohio, there would be no school tax at all generated by all that stuff, because Personal Property Taxes (PPT) - the tax levied on capital equipment and inventory - has been eliminated in Ohio. By the way, I favor the elimination of PPT as a tool to attract industrial development back to Ohio, but it pulled the rug out from under many school districts, including ours. The consequence is to have transferred more of the burden of funding local schools from the industrial concerns to the homeowners and other businesses - another reason our local school taxes have climbed over the years. So if this $600 million facility of Google's had been built in Hilliard, the City of Hilliard would get the income taxes from 80 jobs, and Hilliard City Schools would get property tax revenue on the land, the shell of the building, and probably the power/cooling equipment. It would be a nice chunk of change to be sure, but most of the $600 million would not be subject to taxation. The point is that data centers might sound like a glamorous kind of thing to have in a community, but in reality they don't generate anywhere near the amount of tax revenue as does a professional office building. Dublin has this figured out. Drive up Franz Rd sometime, and see what kind of commercial developments they've attracted: lots of office buildings with thousands of professional workers. Not only does that kind of development generate a good chunk of income tax revenue for the City of Dublin and property tax revenue for Dublin Schools, those workers spend a lots of money in nearby restaurants and other retail establishments, who in turn pay more income and property taxes. Don't get me wrong - I absolutely applaud the efforts of the City of Hilliard leaders to attract more commercial development to our district. But not all commercial development is created equal. With the end of Personal Property Taxes, industrial operations - which is what a data center really is - don't generate all that much income for either the City or the schools. Big box retailers aren't all that helpful either as they employ lots of people, but the average paycheck isn't typically that much. Nor is there any tax generated by their inventory on hand - also eliminated with PPT. By far, the best kind of development is professional office space, which we now see going up as part of the Continental development on the former Dana site at Cemetery and Britton Pkwy. The September 18, 2013 edition of This Week Hilliard ran a story titled "Board Developing Goals to Evaluate Marschhausen," in which I am quoted as saying that we have a "bifurcated constituency" here in our school district. The story said I pulled that phrase from a book I had a recently read, but actually it was of my own choice of words. The book I mentioned is The Diverse Schools Dilemma by Michael Petrilli. So what did I mean? The short answer is that our school district serves two broad sets of students: those who are economically disadvantaged, and those who aren't. Petrilli describes the different needs of those two sets: the parents of economically disadvantaged children want the schools to concentrate on basic reading, writing and arithmetic, while the affluent parents want enrichment programs for their kids. The huge urban and the poorer rural districts therefore need to devote most of their resources to the basics. The small number of ultra-affluent enclaves can spend their money on fantastic enrichment programming. But the suburban districts - like us - are increasingly being caught in the middle, with both a significant population of economically disadvantaged students, and a sizable fraction of kids from affluent homes - plus the whole spectrum between. That sets up a tension as to how scarce resources should be allocated. If that's a sufficient answer to the question of what I meant by "bifurcated constituency," you can stop here. But I hope you will read on. Petrilli is the executive vice president of the Fordham Institute, an education policy think tank which originated in Dayton, and is now based in Washington DC. Petrilli wrote this book for parents who had decided to move back into the urban center and wanted, like him, to have their own kids attend the public schools. Petrilli's wanted his kids to grow up understanding how to navigate in an America with ever-increasing cultural, racial, and economic diversity. He discovered some pretty interesting stuff in his search for the best school to meet that goal. 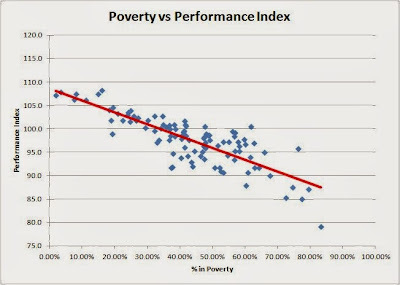 This chart shows clearly the correlation between poverty and academic performance, but we should be cautious about drawing conclusions. It's possible that there a direct cause-and-effect relationship here, but there are certainly other factors in play. In other words, we can't assume a simple solution - that simply raising the standard of living for folks in poverty will also raise the academic performance of their children in school. I suspect that such an effort would have little effect, yet be cripplingly expensive for our economy. Unfortunately, a good deal of public policy seems to develop based on such faulty conclusions, because they play well in the political area. I won't pretend to understand all the reasons for this correlation between poverty and performance, but I have spent a couple of years volunteering as a reading tutor at Sullivant Elementary of the Columbus City Schools, as part of the Columbus Tutoring Initiative (more on this later). Over 90% of the students at Sullivant are classified as Economically Disadvantaged (ie the family income is below 185% of the Federal Poverty Guideline). The Performance Index for this school, a measure used on the State Report Card, is 54.5% - extremely low (our district has an overall Performance Index of 103.6%). Another factor regarding Sullivant, which is not published on the State Report Card, is that fewer than half of the parents have completed high school. This is what I believe is the root cause of the high levels of poverty - the parents don't have enough education to secure jobs which provide a living wage. But it's not the poverty that leads to low student achievement - it's that parents with little education are unlikely to model good learning behaviors for their kids, or help them learn basic skills prior to starting school. Because these parents don't read well, they don't typically read to their kids. Nor do their kids see their parents curl up with a good book just for personal enjoyment. One second grade student I worked with bragged to me about his skills with some video game he played with his dad, which put him in high esteem with his peers, yet he could barely read the lowest level books. Most of these parents want their kids to do well in school and have a better life. They just don't how to contribute to the process. So they count on the teachers in the public schools to make sure their kids learn the basic skills necessary to make it to high school graduation, learn a trade, and if possible, get into college. Contrast this to kids who come from from homes higher on the economic ladder. Those parents have been able to qualify for high-paying jobs because they have more education. When they have kids, they read to them. We had a rocking chair in our kids' room, and we sat in that chair with a kid or two on our lap every night reading nursery rhymes and Dr. Seuss books (thirty years later, and I can still recite the opening couple of pages of Cat in the Hat). So I don't think it's poverty that leads to low academic performance of children - it's that poverty is usually an indicator of the parents' level of education, and it's that which determines what kind of head-start a kid gets in life. The primary role of the public education system is, in my opinion, to lift kids out of that environment, and help them become self-sustaining members of our society. It's a matter of national survival as far as I'm concerned. Back to the "bifurcated constituency" here in Hilliard. Our school district is home to a broad spectrum of families. Some folks are very wealthy - just take a spin up Riverside Dr after the leaves have fallen and check out all the multi-million dollar homes along our side of the Scioto River. Some of the most expensive homes in Franklin County are in that stretch of a few miles. The property taxes alone on on the mansion built by the late Don Ettore are $116,000 per year! While that kind of property is rare, there are thousands of homes in our school district valued at several hundred thousand dollars, occupied by owners well up the economic ladder. That's good for all of us. At the same time, a quarter of our students are classified as Economically Disadvantaged. Some are students with roots going back many generations in this country, others are recent immigrants. Regardless of the cultural background, the students in this category tend to have parents who are unable to support their kids' academic development because of a lack of English language skills. It shows up on page 9 of our State Report Card, the section titled "Gap Closing." This section breaks out performance data, expressed as the percentage of students in each subgroup who achieve the Annual Measurable Objective (AMO) for the subject area. For 2013, the reading goal is to have 83.4% of the students be Proficient or better, and for Math it is 78.5%. *I believe the category "African American students" includes those students who are recent immigrants from Africa. Such students usually fall into three categories: African American (because no other racial category fits), Economically Disadvantaged, and Limited English. We don't have clear data for African American students who are not recent immigrants, but I assume that the performance correlation for this subgroup is not to race, but rather to economic status. So while our Overall achievement is above the goal, the categories I've shown in bold are all below goal. Because so many of these subgroups are below goal, our overall rating for Gap Closing was a "D" - one of two "D"s we received on our report card. What was the other "D"? Ironically, it was in the Progress category for our Gifted Students (see page 7). The needs of these two categories are diametrically opposite, a situation Petrilli found when he was investigating schools for his kids to attend in the Washington DC public school district. The Economically Disadvantaged students benefit most from being taught basic skills, regardless the grade level, but critically important at the primary level. Meanwhile, the more affluent parents select a school district based on the quantity and quality of enrichment opportunities: gifted programming for elementary students, college level curriculum at the high school level, successful athletic programs, and superior performing arts organizations. They assume that their kids will breeze through the basic curriculum, and want them to have access to much more. So it becomes a matter of resource allocation. Since 86% of our operating budget is used (appropriately) for the compensation and benefits of our team of teachers, staff and administrators, what decisions should we make about reconfiguring our team to address the issues pointed out on our State Report Card? One reaction could be to simply disregard the State Report Card. I don't know what repercussions this might have, but typically the way the State gets school districts to comply is by threatening to take away funding. I've suggested on more than one occasion that we should just declare our district to be a charter school, and escape from most of the mandates which apply to a public school district. That's not as crazy at it seems - I bet we could run one building as the state-mandated K-12 public school, and sell the rest to a new charter school corporation, staffing the new charter school with the same team of teachers (who could continue to organize as the HEA if they want). The trick is how to do local funding, since only a public school district can levy local taxes. That not being a very likely scenario, we might decide that the only way to bring up the performance of the Economically Disadvantaged students is to assign more teachers and other professionals to work with these students. Then we have another choice to make: do we create these new positions by passing additional levies to fund the additional compensation and benefits costs, or do we eliminate other programming and services so that the total personnel costs remain the same? And if we decide that we're going to reallocate personnel, what programming and services are we willing to eliminate? Since we couldn't mess with basic, state mandated curriculum, the only candidates for elimination would be the enrichment programs I listed above. But if we do that, at what point does our district become unattractive to the most affluent, and therefore most mobile members of our community. And if they start leaving, what happens to overall property values? It's not hard to imagine. It would be a repeat of the "White Flight" that has all but destroyed most urban school districts around the country, although today it would be more accurate to call it the "Flight of the Affluent" as the upper income strata are now occupied by families of all racial and cultural backgrounds. Hilliard would begin to look like South Linden, the Hilltop, Franklinton and many other Columbus neighborhoods which were once home to working class families, but are now mostly rental properties occupied by families living below the poverty line. Once well-maintained homes would fall into disrepair, further driving down property values, and employers would seek better places to base their operations. Income and property tax revenues would fall, diminishing the ability to fund city services and the schools. It's a death spiral that results in communities that look like Whitehall or Groveport, once well-funded suburbs that have been suffering since the closure of DCSC and Lockborne Air Force Base. I do think we have to take a look at the richness of our high school course offerings. There are some classes we offer for which very few students sign up. But it's not a matter of saying "let's discontinue X and reassign the teachers to Y," as teachers are licensed in fairly narrow subjects, meaning the teachers of X aren't likely to be licensed to teach Y. This is a transition best done over many years as teachers retire, when we can replace an X teacher with a Y teacher rather painlessly. But if we're going to do this, we need start thinking it through and planning now. I think we need to explore ability-based grouping of students in the elementary levels. This is often called 'tracking,' and was the norm when I was in elementary school 50 years ago. At some point, the education community decided that it's harmful to low-performing students to be segregated from high-performing students. I recognize that I'm not a professional educator, but I think this is an experiment in social engineering that hasn't panned out. Petrilli rightly points out that this kind of segregation happens in the upper grades automatically: high performing students take the honors and AP classes while the low-performing students take less challenging electives. I've spent hundreds of hours in elementary classrooms over the past four years. One key thing I learned is that it's very challenging for our elementary teachers to deal with a classroom of 25 students who have performance levels ranging from barely able to read to some who I suspect are the geniuses who will change our future. What "expert" determined that the notion of an elementary teacher sitting down to work with a small subset of students at one ability level while the rest of the kids are supposed to "work independently" makes any sense? Perhaps both the lower-performing kids and the higher-performing kids are best served by grouping kids by ability, allowing the teacher to spend all of her/his time with all of the students. It seemed to work for my generation. I've been a volunteer in the Columbus Tutoring Initiative for the past four years. The first two years were spent at Sullivant Elementary, as I mentioned above. I had the privilege of working with the same student, Nicholas, for both years, as both a first and second grader. He started out not wanting to be in the program, as it meant giving up his mid-day recess once each week. But over time, it became an important part of the week for both of us - a mixture of both fun and serious work. He started out barely able to read, and by the end of second grade, was reading ahead of grade level. I won't pretend that Nick's progress was solely due to my work with him. On the contrary, he had the benefit of talented, effective, and caring primary and intervention teachers at Sullivant, and they did all of the heavy lifting. But beyond the practice work we did together in these one-on-one situations, my fellow tutors and I were just ordinary folks modeling fluency with our language and a joy of learning. Last year we brought this program to our own Beacon Elementary, and will be returning there this year as well. In addition, we're starting up a program at Hilliard Crossing Elementary. Both will take place on Wednesdays at lunch, beginning with an orientation session on 10/9, and kick-off with the kids on 10/16. I invite you to donate one Wednesday lunch time each week through April to serve with us. The more kids we can help via these programs, the more who will have successful school careers, through high school graduation and beyond. In the coming years, we hope to expand to more of the Hilliard elementary schools. We must break this cycle of poverty, which is perpetuated by the failure of kids to complete the education necessary to find self-sustaining jobs in our evolving economy. And they can't read to learn until they learn to read. This reading program makes a difference. Will you help us be part of the solution? For information on the Beacon Reading program, click here. For information on the Crossing Reading program, click here. Here are the supplemental materials provided in preparation for the regular meeting of the School Board, to be held Monday September 23, 2013 at 7pm, at Hilliard Crossing Elementary School. "Based on its consideration of the factors established in division (A) of this section, the board may pass a resolution declaring the impracticality of transportation. The resolution shall include each pupil's name and the reason for impracticality." My question has been posed to our legal counsel, and we'll get an answer before the vote. I also invite you to attend the Hilliard Darby Marching Band Invitational, being held Saturday 9/21 at the Bradley High School. Fifteen bands from high schools all around our region will be performing, including Bradley, Darby, and Davidson. Here is the schedule. Notice is hereby given; there will be a SPECIAL meeting of the Board of Education of the Hilliard City School District on MONDAY, SEPTEMBER 16, 2013 at 7:00 P.M. located at Hilliard City Schools Central Office Administration Building, 2140 Atlas Street, Columbus, Ohio. The meeting will be a work session to discuss the evaluation process for the Superintendent and Treasurer/CFO. Notice is hereby given; there will be a SPECIAL meeting of the Board of Education of the Hilliard City School District on WEDNESDAY, SEPTEMBER 18, 2013 at 7:00 P.M. located at Hilliard City Schools Central Office Administration Building, 2140 Atlas Street, Columbus, Ohio. The meeting will be held in executive session preparing for, conducting, or reviewing negotiations or bargaining sessions with employees. Here are the supplemental materials provided in preparation for the regular meeting of the School Board, to be held Monday September 9, 2013 at 7pm, at Alton-Darby Elementary School. The agenda is fairly routine, with a couple items of note. Item F1 authorizes our liability insurer to pay a settlement claim related to a personnel matter. No impact on our operating budget - this is why we buy liability insurance (correction: we did have to pay the $2,500/claim deductible). As is our pleasure each year, we welcome several foreign exchange students to our schools, to our community, and for the host families - into their homes. It's a substantial commitment for all, and it should be a point of pride that these students want to come here. This year students join us from Germany, Korea and Japan. Per Board Policy KH, we will be voting to accept a substantial list of donated materials, totaling $136,000 in value, much of it provided by PTOs and Booster organizations. Thank you to all donors. House Bill 153, passed by the 129th General Assembly in 2011, and incorporated into section 3327.02 of the Ohio Revised Code, allows a school board to declare by resolution that it is impractical to provide transportation to a student, and to instead make payment to the student's family. The law doesn't specify how large this payment should be, only that it is an "amount that shall be not less than the amount determined by the [Ohio] department of education as the minimum for payment in lieu of transportation, and not more than the amount determined by the department as the average cost of pupil transportation for the previous school year." The ODE has set the minimum to $240.66 and the maximum to $813.79 for this year. Superintendent recommends ... that the Board of Education authorize the Director of Business to decline as impractical any request or route of 20 or less students and approve parent applications for the payment of $250 in lieu of transportation as per criteria set by the State Department of Education. I read this to say that the Administration wants to be given blanket authority for an indefinite period to define a bus route that would pick up 20 or fewer students, then declare it impractical to serve that route, instead paying $250 (per year) per student, meaning up to $5,000. I see a few problems with this. The indefinite nature is one. I'd prefer that the Board be given the opportunity to review and approve the list of students who the Administration recommends be given payments in lieu of transportation - just as the Board approves bus routes each year (actually, it is required to do so by law: ORC 3327.01). I am interested in this information, and I also think future School Boards might also be interested. This resolution as worded would seem to make the decision process invisible to future School Boards. And since we have Board Policy EEA dealing with student transportation, it would seem like the appropriate route for this legislation would be to have the Policy Review Committee look at it first, and incorporate whatever language is decided upon into Policy EEA. Transportation matters are important. I understand that it's a big deal to tell parents that their kids won't be provided transportation, meaning the parents have to figure out another way to get their kids to and from school each and every day. I'm not sure what the fair compensation should be for being denied that service. We can calculate the cost per student for transportation in our current mode (the ODE says it's $684.21/yr), but I don't think $250/yr is a fair reflection of what it would cost parents to transport their own kids for 180 days. I am not inclined to vote in favor of this resolution, but will listen to the discussion at the Board meeting before making my final decision. Finally, although not on the agenda, the Board will be announcing three working sessions to take place over the next two weeks. I believe that the sessions on Sept 10 and Sept 16 will be held in executive session so that we may begin preparing for contract negotiations with the Hilliard Education Association (teachers' union) and OAPSE Local #310 (support staff union). On Sept 18 there will be a public session to discuss the performance plans for the Superintendent and Treasurer. Watch for the formal announcements.